Discussion in 'Headphone Amps (full-size)' started by phredd, Feb 9, 2014. This isn't intended as a review, but as the start of an Objective 2 appreciation thread. I've had the Objective 2 + ODAC Combo for a couple weeks now and I absolutely love it. I may be late to the party, but I believe there are at least hundreds of other O2 owners out there that probably appreciate their amp as much as I do. Please share your thoughts AND PICTURES! I've only tried a handful of amps, starting with the Bithead years ago. I don't think it's necessary to compare this with other amps to know how good it is. It sounds great! I first tried it with the Sennheiser HD700, which I really liked. Then I got the HD800 (still can't believe how much I spent) and now it all just sounds so perfect!! Perfectly clear. Just really perfect music! The Objective 2 is very clean and detailed, which is what I want from my amp. I get all the bass I need from my headphones. And if I need more, I can boost with EQ. This O2+ODAC is from JDS Labs and I can't say enough about how great my experience has been. John Seaber is incredibly responsive and accommodating. And their products are top notch. I was pleasantly surprised that I was able to place an order in the afternoon, including customization and two laser engravings and it still shipped the same day! The O2+ODAC works easily with both the Mac (and I'm sure PC) and the iPhone and iPad. I prefer the software and convenience with my iPhone, still processing the crossfeed digitally before going to the ODAC. The only way I was able to connect my iPhone's digital output to the ODAC without an error message was to connect through the Lightning Camera Connection Kit to an AC powered USB hub and then from the hub to the ODAC. John Seaber had success with a USB-powered hub, so you may get lucky trying that. The Objective 2 is designed to be neutral, so with the worst of the reviews complaining that it's too neutral and lacking bass punch, I'd say the amp is success! And the price is right. So kudos to the designer, NwAvGuy. I've read so many positive comments all over the web on the Objective 2, so I was surprised that nobody here has yet started an appreciation thread. Please comment on your experiences with the Objective 2 and O2+ODAC. And post photos of your O2 engraved. Here is a photo of mine with a sentimental engraving of a show I used to watch as a kid of a "mop-topped boy band that would just fade away." Tonight is the 50th anniversary of their first appearance on Ed Sullivan. That rant aside though, I enjoyed the O2 and ODAC for the time I had them. They're very good for the price and a good segue into higher-end offerings. What I enjoy most about the O2 is its versatile volume pot that shows very little channel imbalance even at its lowest position. Wow. I wasn't expecting a rant at all in response to my starting an "appreciation" thread. Besides, I never said that the lack of bass punch is why they're neutral. I simply said that the worst criticism by reviewers was that they were "too neutral" AND "lacking bass punch." Although, once you boost the bass in amp that offers that control, you no longer have a neutral output. How you do that? looks very nice to add a custom image to personalize one's amp look. 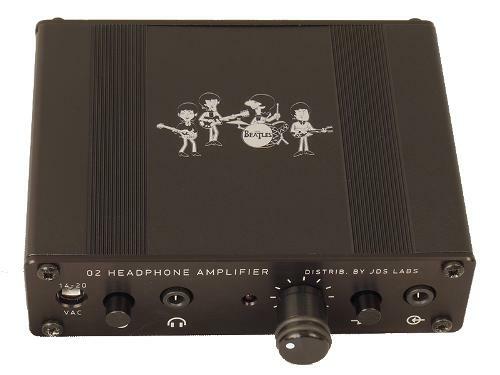 JDS Labs offers free engraving with their amps, just include a JPEG. The O2 booster PC board that I cooked up may help with that if the headphones involved are especially current hungry (low impedance + low sensitivity). I just posted a V3.0 update that also adds a headphone output relay to the O2 to help mitigate some of the O2's turn-on and turn-off thumps. The O2 headamp is definitely a lot of fun! I agree that the O2 is a lot of fun! My headphones are medium impedance (300 ohms) and high sensitivity (102 db), but thanks for the pointer. Maybe others will find your booster board useful. The Objective 2 is designed to be neutral, so with the worst of the reviews complaining that it's too neutral and lacking bass punch ... I'd say the amp is success! You forgot the end of my sentence. I wasn't complaining. I like neutral and I get just the right amount of bass from my headphones with the O2. I couldn't be happier! Oh, be sure to make the white areas, the areas you want engraved, black on your JPEG -- like a film negative. My objective 2 arrived several days ago with wall wart adapter rated maximum 12 VAC @200ma As I know O2 need minimum 14. but amp runs OK, Also I have Magni adapter rated 16 Vac can I use it with 02? The Triad WAU12-200 is/was NwAvGuy's default recommendation for Objective2. Actual output is approximately 13.5-14VAC. O2 is internally limited to +/-12V. Diode and regulator losses require input of 13.5-14VAC for optimal operation. Higher voltage input will be wasted as heat. Thank you for the response I have exactly same adapter Triad WAU12-200 and I will stick with using it. but in case if Triad damage can I use Magni adapter anyway? I do have one more question please, can I use this adapter for O2? I need European voltage. My friend measured it, it is AC/AC adapter output is 13.97 VAC only problem I see is it has 1A, default triad has 200 MA, is it a problem ? I believe Magni uses a 15VAC adapter, so it should work with O2. Perfect. A device consumes only as much current (mA) as it needs; 1000mA is fine. In fact, we stock a 15VAC 1000mA EU adapter.